Tinytags help validate the performance of a college Building Management System, and help verify that temperatures remain within the required range. South Devon College is using Tinytag data loggers as part of daily facilities management to help ensure that temperatures within the buildings remain within the specified guidelines, which in turn helps to ensure the comfort and wellbeing of occupants. Heating and room temperature issues can be an ongoing problem without having precise data proving that the temperature of the room falls within the guidelines. Room temperature is controlled by a BMS, but by using the loggers, Deputy Property Service Manager Dave Walker is able to confirm that this is functioning correctly. Ten Tinytag Transit 2 data loggers are deployed when requested to monitor room temperature. In addition, by being able to determine the room temperature at different times especially over the weekend, it has been possible to adjust the timings for the heating to activate on a Monday so that the rooms get to the required temperature prior to students arriving. Results of the monitoring have shown that rooms fall within the required temperature, or have identified where heating is not coming on in the morning and the BMS was adjusted. Graphs provided by the Tinytag Explorer software help explain to staff how the temperature fluctuates within the room during different times of the day. 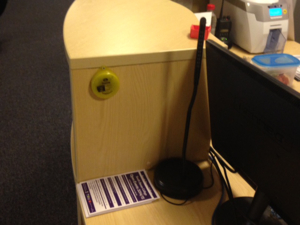 The Tinytags were initially recommended by SDC South West Energy Centre staff. Five were purchased for a trial, with an additional five then purchased due to the results successfully gained from the monitoring. Dave comments, "Tinytags are easy to use and provide results that are easy to understand. They are an asset as they provide accurate information about current room temperatures especially over weekends/night time, monitoring how heating systems are performing. Loggers are able to be set to activate the LED alarm when the temperature drops below 16°, enabling us to visually confirm whether the temperature has fallen below this."